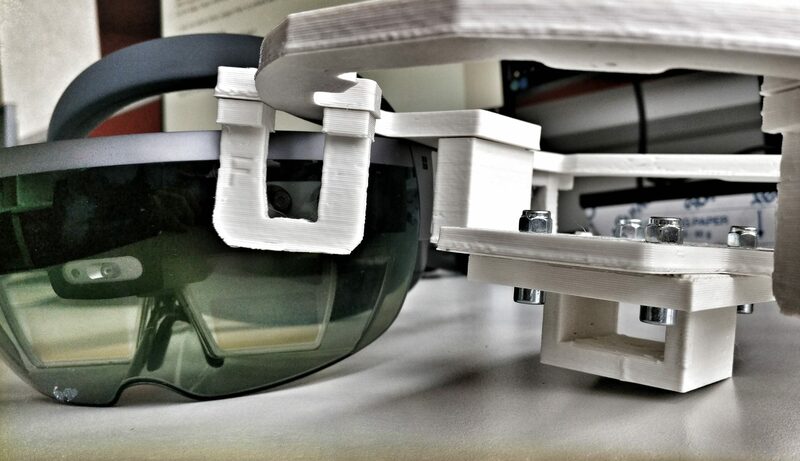 Digital Healthcare, Mobile Development, HoloLens and more! Andreas Jakl is a lecturer for Digital Healthcare @ St. Pölten University of Applied Sciences and Microsoft MVP for Windows Development. The vision: automatic checklists, filled out by simply listening to users explaining what they observe. The architecture of the sample app is based on a lightweight architecture: HTML5, Node.js + the LUIS service in the cloud. Such an app would be incredibly useful in a hospital, where nurses need to perform and log countless vital sign checks with patients every day. In part 1 of the article, I’ve explained the overall architecture of the service. In this part, we get hands-on and start implementing the Node.js-based backend. It will ultimately handle all the central messaging. It communicates both with the client user interface running in a browser, as well as the Microsoft LUIS language understanding service in the Azure Cloud. I’m using the latest version of Node.js (currently 9.3) and the free Visual Studio Code IDE for editing the script files. 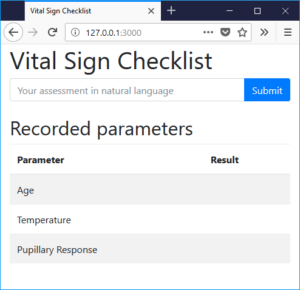 Create a folder on your PC (e.g., “vitalsigns-checklist”) and open a PowerShell window. The easiest way is to right-click on the folder name in Windows Explorer while holding the “shift” key on your keyboard. From the popup-window, choose “Open PowerShell window here”. Enter all the info as you see fit. This sets the app name and other details like the version, license or your name. You can stick with the defaults for everything if you like. Next, open the folder with Visual Studio Code. Right now, the repository only contains a few files, most importantly the “package.json” that was generated by “npm init”. For the client-server communication, we will use the “Socket.IO” module, as it’s more versatile than traditional AJAX. And finally, the request module simplifies the https request to the language understanding service. For the client-side UI, your server will need to provide HTML files, along with images and stylesheets. The best way to do this is to create a folder within your app. Call it “public”. In the newly created “public” folder, create two files: “index.html” and “language.js”. This will be what your users will see when they request the main page from your server. These files will be rendered in the browser of the client. Bootstrap provides great UI templates that make the app look nicer. Essentially, I’ve included it mainly for the pre-built CSS, so that I don’t have to style the app. Additionally, Bootstrap depends on JQuery, which is also helpful for updating the UI with results received from the server. The code for “index.html” is directly based on the Bootstrap 4 starter template. Code for index.html of the Vital Sign Checklist app. The second row is a table with the three lines. These will be filled by our backend through the language understanding service: the age, temperature and pupillary response. The initialization is short: after the document is loaded, we first make sure the error message is not visible. Then, we initialize a web socket to the server. This will be used for the communication via socket.io. Next, we need to handle the form submission. The most important line of the following code: calling socket.emit(). This sends the user-entered text to the server, using the message ID “assessment”. The ID is defined by us, and if the server expects a message with the same ID, the communication works. First, we hide a potentially still visible error message from a previous, failed submission attempt. Then, we also clear the entered text from the input field “#assessment_text”. This allows the user to immediately start typing the next assessment. Finally, we use preventDefault() to make sure the browser doesn’t reload the whole page when the form is submitted. That would be the standard behavior. However, we will dynamically update the page on-the-fly, without ever reloading the whole HTML content. Only the error message is slightly different – we also ensure the line is visible to the user by calling show() on the div. That completes the UI. It allows for full user interaction and real-time communication with the backend hosted on a Node.js server. Also, it shows the extracted checklist items from the entered assessment in the appropriate places of the UI. In the next part of the article, we’ll set up the LUIS Language Understanding service from Microsoft.